It seems shooters everywhere are coming up with lists of their most favorite features of the successor to the Plus II radio trigger. The photographysilo.com piece was written by Lawrence Atienza. He also appears on the same page in a YouTube video interviewing PocketWizard’s own Dave Schmidt, which was shot at WPPI 2012. Do you have a favorite list of features of the Plus III? Let us know, and tell us why. You might see yourself credited on our blog. Be sure to include a link to your own site. Thanks! Some of us are old enough to remember the days when hockey players were not required to wear mouth guards and helmets. There were a lot of toothless guys on the ice who had no problems suiting up again and again to do battle with wooden sticks. Bones were broken, noses bloodied, and equipment got seriously abused. That said, it’s nice to see PocketWizard gear can take any damage the NHL can dish out. Check out this segment from a Pittsburgh Penguins and Washington Capitals game, as posted on YouTube by the NHL. Alexander Ovechkin of the Capitals not only scores on Marc-Andre Fleury, but takes out the net cam, remotely fired with a PocketWizard MultiMAX. Watch carefully, and you’ll see a technician remount the PocketWizard back on the camera. 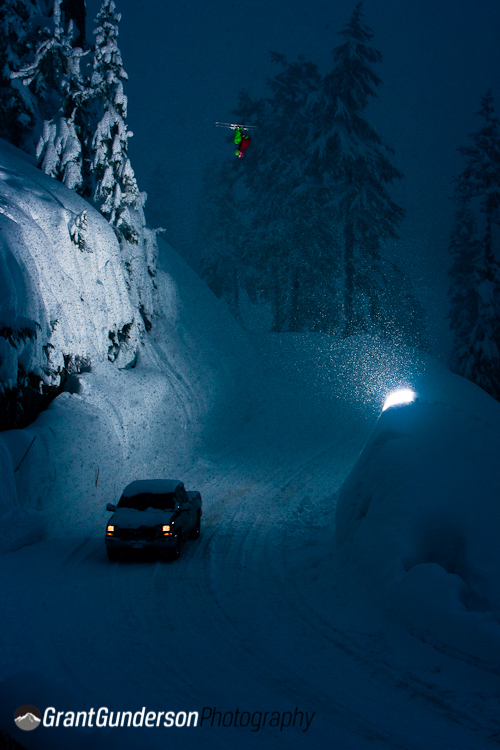 If anyone knows who the photographer is, give a shout. We’d love to credit him, as we do with all shooters who use PocketWizards. John B. Holbrook, II has been building up his lighting equipment over the past year. He recently wrote two posts on his blog, Thru My Lens, about his use of the PocketWizard FlexTT5 and the PocketWizard MiniTT1. Based in downtown Washington, D.C., Moshe Zusman has been passionate about photography for the past seven years. Four years ago, he left the world of second shooting and assisting behind to begin the transition to full-time professional photographer. An enthusiast of workshops, seminars and trade shows, Zusman used these resources to gain his formal training. He now teaches workshops of his own at CDIA in Washington, which is a Boston University satellite program. Every so often we come across a photographer operating in an area of professional work where we’ve come to expect a certain level of competence and typical array of stock poses or compositions only to find they are turning those conventions on their head. Zusman is one such shooter. Largely working as a wedding photographer, his groupings of wedding parties, the posing of couples, and the textural compositions he puts together are tasteful, yet uncommon. Many of his images remind one of well-crafted paintings, rather than informal portraits. His eye for building these shots is uncanny, and his average wedding shot is something many young couples would be fortunate to have one or two of in their albums. Zusman credits social networking as being pivotal in the success of his photography business. “Right after WPPI three years ago, I came back home and I really implemented a lot of what I heard there. It really worked,” he says. Self-marketing has risen high in his priorities, and he regularly attends many events. He also posts photos online within an hour of when they were taken, fully edited and tagged. As an instructor, Zusman finds himself still learning from other shooters. “I always look at other photographer’s work and I get inspired. I try not to copy them but I just need to get inspired by ideas and I don’t think anyone here invented the wheel but we definitely make it right,” he explains. He also credits his students as being a source of new ideas, and considers his own style as being fluid and changing regularly. Moving across genres, Zusman not only shoots weddings, but also corporate and food photography, to name but just two more. “Weddings have always been my passion and always will be,” he declares. “I try to bring the same ideas I do in weddings to keep things edgy. As you know, I’m a big fan of breaking the rules in photography, so I’ll definitely blow up a photo if I have to, if I want to. I sort of bring all that into corporate photography as well to the corporate level.” His corporate work largely comes about by word of mouth referrals. His main camera body is a Canon EOS 1D Mark IV, and for manual focusing jobs, he sticks with a Canon EOS 5D Mark II, which is often employed for architectural shots. He exclusively shoots digitally, and has never shot film. “I switched to prime lenses about two years ago,” Zusman says, although he still shoots a variety of zooms, citing the 70-200mm as his favorite. All his images are run through Adobe Lightroom. He credits enhancement work in the red and blue color channels as being critical to his saturation levels and overall look. 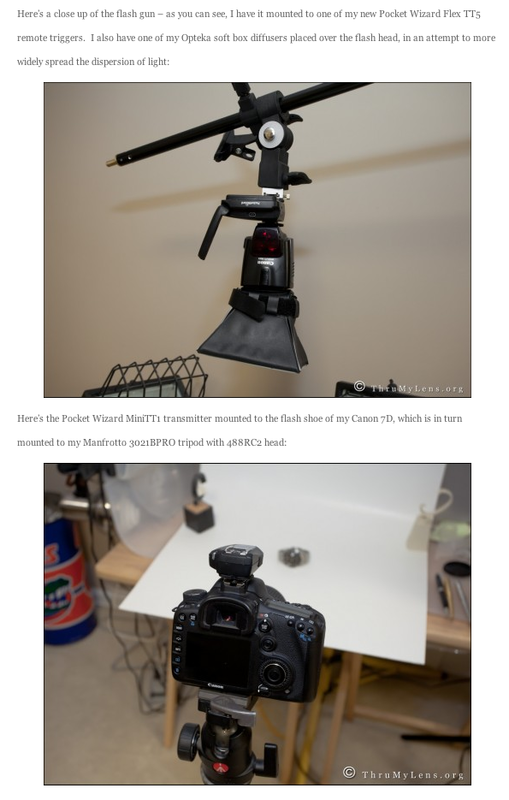 Michael Willems and his nifty blog, SpeedLighter.ca, have posted an interesting article about how to modify a Photoflex DualFlash bracket so it can hold two flashes or a flash and a PocketWizard for use on a light stand. The modification appears to be quick and simple. Although we haven’t tried it, it seems like a good idea. Nice job, Michael! With a degree in Plastic and Composite Engineering, Grant Gunderson is no stranger to fluid dynamics, torque, and tensile strengths. One can’t help but wonder if this training has helped nudge him in the area of photography he now makes a living in: high speed flash skiing photography. 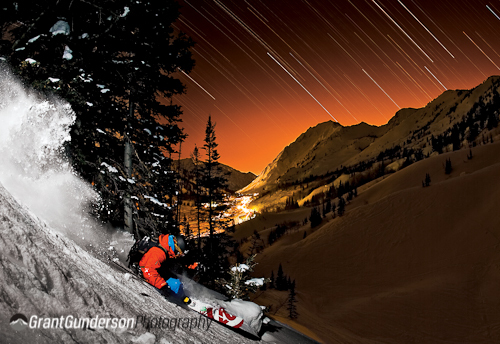 Beyond the physics, fully understanding all aspects of his subject matter is also critical to Gunderson’s holistic approach to capturing the world of skiers. In this way, he knows what the audience of publications he sells to want. 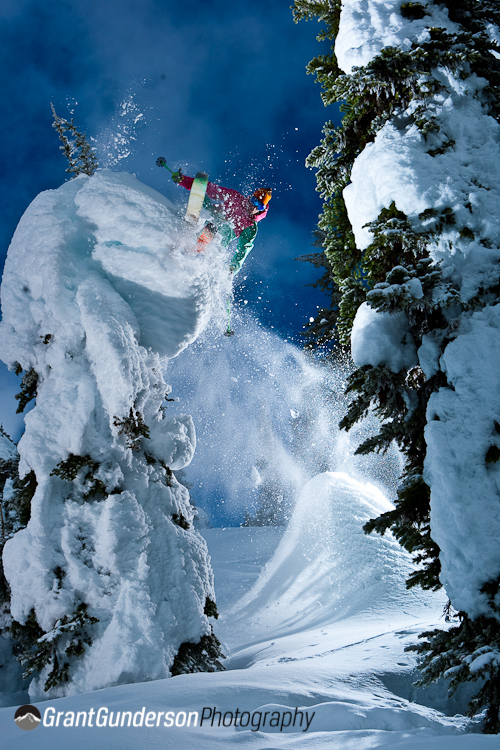 “Skiing is a fairly small niche and I think if you’re going to succeed in ski photos you’ve got to be able to create images that speak to the culture of skiing, and not just create a unique photo,” he explains. 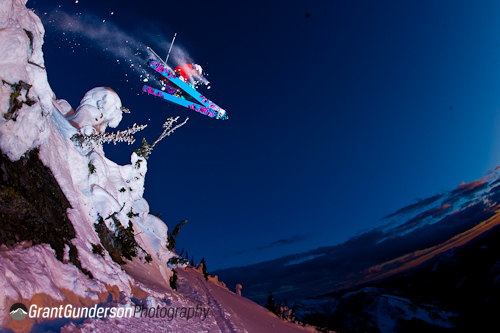 In the winters, he travels from his base in Washington State to anywhere in North America to capture downhill action. 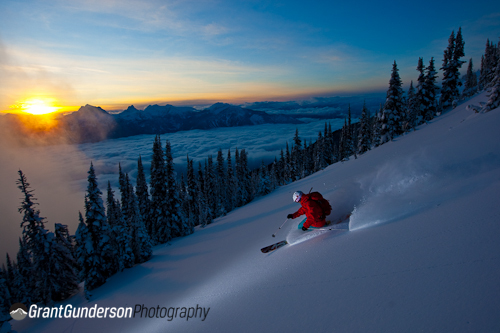 His main areas of concentration are Western Canada and the Western United States, but every major hot spot for skiing in both nations are also regularly visited. This year, he also traveled as far as Iceland and Norway for photo shoots. 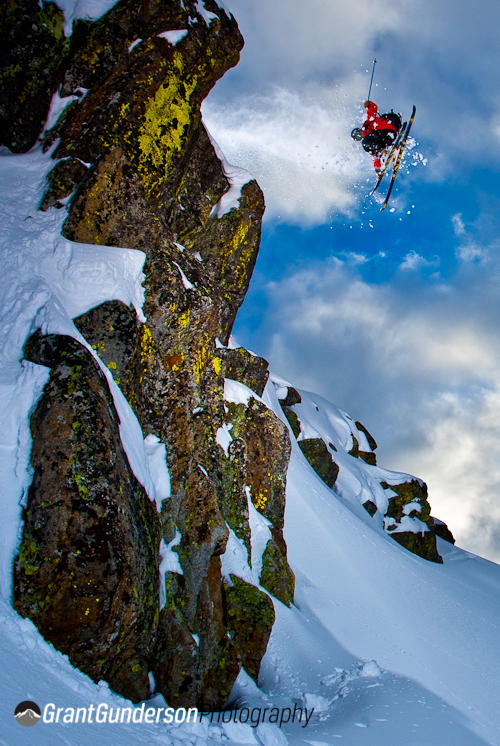 In the summer, he heads to South America to take advantage of winter skiing in the Southern Hemisphere. Getting to his locations is no small feat, either. “Everything we do is on our backs, so it’s a little bit of physical labor. Luckily, the athletes and the media I work with seem to be more than willing to carry some flash packs. They’re not exactly light,” he says, laughing. Gunderson shoots a Canon EOS 1D Mark IV prototype. He avoids Photoshop and uses Lightroom to process his images. “I learned how to shoot on slides with Canon,” he says. Shooting digitally and only using Lightroom “keeps it kind of pure,” he explains. 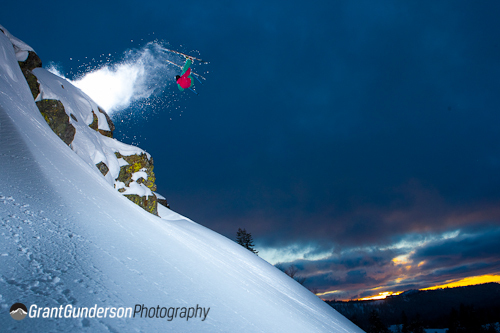 To help freeze an athlete flying off a cliff, Gunderson relies on HyperSync technology from PocketWizard. “The HyperSync is whole new game‑changer,” he declares. “It’s the best. That’s the single most important technological advancement I’ve seen in the last decade.” An off-camera flash enthusiast for at least the last five years, he is very in tune with the latest gear developments which help him achieve his signature style. As Gunderson’s career marches on, he remains fluid in both his adaptation of new photographic technology, and his creativity. 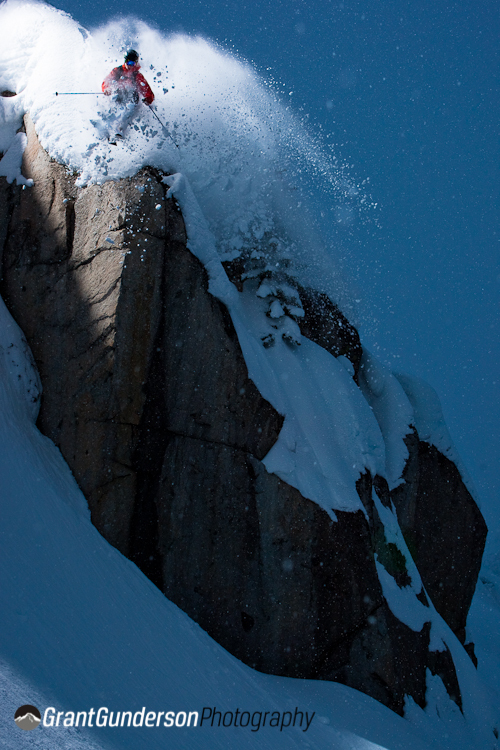 Although we have limited space here to represent his work, the larger body of his photos show a surprising range of composition within the narrow range of skiers caught in midair. With his engineering background, it’s no surprise he understands controlled environments and the science behind high speed flash photography. What is surprising is his adept handling of the chaos ensuing when an athlete breaks from the trees a few yards away from him at a high rate of speed. 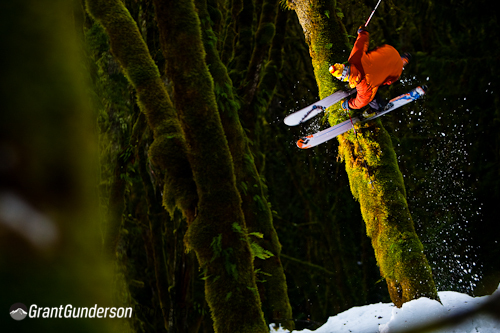 Lucky for ski fans around the world, Gunderson is prepared and knows what to do. Keith Pytlinski of M5 Photography shared a dramatic shot on his blog recently. Using PocketWizard Plus II units, he got this exciting image shooting into the sun, uphill, with a lot of frozen action, including flying dust. We love the lens flare and energy behind the entire shot. 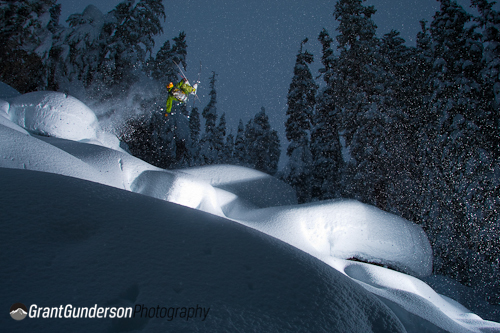 Visit his blog and breakdown of the set-up, which also includes details on digging berms and a voice-activated tripod! Nice job, Keith! Check out other posts about Keith’s work: 1, 2, 3.